Remember the 2012 Olympics? Watching Paul McCartney perform "Hey Jude" during the Opening Ceremonies reminded us of Lucidchart's version of the song -- have you seen it? We truly value the feedback our users provide every day about how Lucidchart can continue to be the most innovative and efficient diagramming application on the market. As a result of that ongoing feedback, we are excited to announce a number of new features in Lucidchart. Read on for details about Lucidchart’s new image manager, layer controls and more. As Lucidchart has grown, so have users' image libraries. After uploading hundreds of images, some users found their image libraries to be somewhat unwieldy. 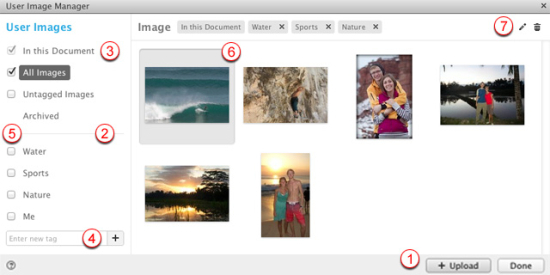 The new image manager solves this problem by providing you complete control over the organization of your images. Previously, ‘Bring to Front’ and ‘Send to Back’ options were available when right-clicking on a shape. For more fine-grained control of layers, ‘Bring Item Forward’ and ‘Send Item Backward’ options have been added to enable movement one layer at a time. We are confident this small change will make a big difference when creating wireframes and mockups. A common feature request has been the ability to use subscripts and superscripts. When editing text, you will now see this option in the properties bar. Simply select the text, press the subscript / superscript button and it will update accordingly. After the launch of Google Drive, Lucidchart quickly became one of the top apps and was even featured in the keynote session of Google I/O (video here). Join the 400,000 people who have already installed Lucidchart from the Chrome Web Store today! Similarly, Lucidchart remains one of the top apps for Productivity and Education in the G Suite Marketplace. Install Lucidchart from the Marketplace now to bring Lucidchart to your entire domain. As always, we look forward to hearing from you if you have any questions, suggestions or feedback.